Clear anodized tubes have a machined wrench flat on one end for ease of adjustment. Tubes have .156" wall thickness, are available in variety of lengths. 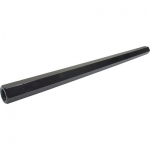 The 56400 series tubes are 7/8" in diameter and both ends are tapped 5/8", one RH and LH.